The SoCal Steam Clean staff is IICRC certified and trained in the best methods in cleaning tile, stone, and grout. We take pride in not just getting the appropriate training, but also keeping up-to-date on the latest cleaning methods and technology, so that we are always utilizing the most effective cleaning methods and machine. We make sure that your tile, grout and stone are being cleaned in the best way possible. Tile and stone flooring is elegant, keeps a home or office cool on a hot summer day, and is somewhat easier to maintain on your own. However, just like cleaning carpets, giving tile, stone, and grout a real deep cleaning can only be done right by professional cleaners. Cleaning tile, grout and stone is a back-breaking job that must be done properly in order to attain satisfactory results. Nobody really has the spare time to clean their tile or stone floors, so we’ll save you from the agony of this job, and do it properly. After our certified staff is through, you’re hard surface flooring will look better than it has ever looked. 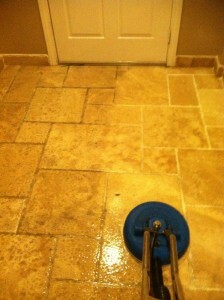 SoCal Steam Clean is proficient at tile, stone, and grout cleaning. We use a very powerful, yet wholly safe cleaning solution, and a high-pressure, hot water rinse within an enclosed state-of-the-art vacuum system. Our equipment will thoroughly pressure wash the surface, and will extract all the built up gunk and grime that your tile or stone floors have been absorbing throughout the year. Our method will restore the wonderful glimmer and brilliance to your stone, tile or grout surfaces. The sealant we offer minimizes the possibility of staining; creating a protective barrier that blocks penetration of foreign materials. We guarantee you’ll be satisfied with the results, and if you’re not satisfied when we’re done, we’ll keep at the job until you are. Inspection: We will inspect the flooring, and act accordingly based on your particular tile or stone flooring and grout. Furniture: We will move furniture around as we see fit, but we will not touch any liability-prone pieces of furniture. Scrub/Brush: Depending on your flooring, we will machine scrub or hand brush the tile or grout. With stone flooring, we may go ahead with a natural stone cleaning and polishing. Rinse: After that, we’ll start the high heat, high pressure rinse with a state-of-the-art cleaning machine for a very deep clean. The machine will loosen and bring up all the dirt and grime. Wipe Down: Once the rinsing process is done, we will do a final wipe down to wipe away all the leftover soil and dirt that’s left behind. Sealant: In order to repel water or stains, we will apply a sealant to your tile or stone flooring. The sealant will hold for months, lengthening the life of your tile, stone, and grout.